A Costa Rica honeymoon has something for everyone! Any couple looking for a relaxing honeymoon destination will love Costa Rica. The local vibe is very laid back and welcoming and will make nay couple feel right at home. There are dozens of beaches to lounge on from along the Pacific coast to the Caribbean coast, and chances are high you’ll spot some local monkeys hanging around, too. For the more adventurous couples, there are plenty of extreme sports to keep you occupied from zip lining to scuba diving- not to mention the endless rainforests to discover and hike. The fresh seafood is unforgettable, and you’ll never eat the same dish twice because the flavors change the closer you get to the Caribbean coast. You’ll not only fall more in love with your partner, but you’ll fall in love with this amazing, diverse country. There's nothing quite like a Costa Rica honeymoon. Here's how to start planning yours. The peak tourist is during the dry season from mid-November to April. There are more tourists and prices are up because of the perfect weather. From May to mid-November there are less tourists and prices drop because it constantly rains. Canopy Tour: Zip line through the rainforests of Costa Rica. Monteverde Cloud Forest Biological Reserve: A rare ecosystem full of one of the highest concentrations of biodiversity. 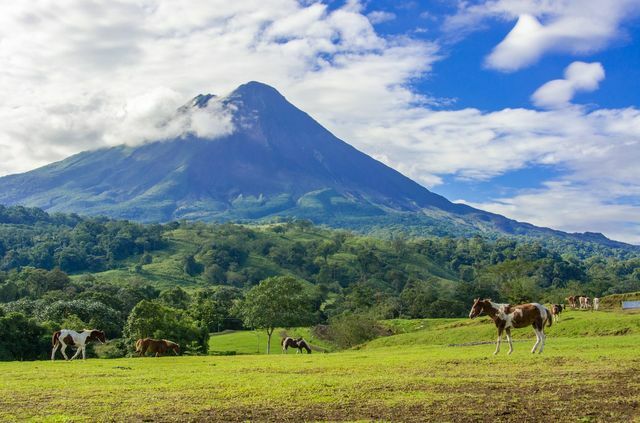 Arenal National Park: An active volcano near the town La Fortuna. Tabacon Grand Spa Thermal Resort: Relax and enjoy this spa. Tortuguero National Park: A protected wilderness area to see sea turtles on the Caribbean coast. Sloth Sanctuary: A center focused on rehabilitating the sloth population. Rincon de la Vieja National Park: Learn about boiling mud pots in this high geothermic area. Manuel Antonio National Park: Enjoy beaches, rainforest and lots of wildlife in this nature preserve. National Stadium in La Sabana: Watch a soccer (futbol) game. Hi All- we have booked our Costa Rica honeymoon looking for suggestions on what not to miss while we are there! Thinking about Costa Rica for our honeymoon, any suggestions on places to stay or dos and donts?